I started strumming fifty years back when I was only thirteen year old. In pursuing the passion, I was virtually impressed by my father Abdul Ghani and uncle Purdom, both fine-tuned instrumentalists of the time. They used to play sitting around the central hearth of traditional Chitrali house (baipash) and basking the warmth of oak fire during the long cold winter nights, and I intently listened and observed them. Gradually I felt the urge to touch sitar, caressed its strings and made up mind to play it secretly since children were then discouraged to look at musical instrument, let alone playing it. Initially, I practiced with great devotion and hardly slept at night. In the course of time, my skills improved and expanded. Intuitively, it dawned on me how to set up proper coordination of fingers and gain natural rhythm to produce better music. When my father knew about my new passion, his response was somehow ambivalent, but was left with no option except to encourage me later on. I avoided compound melodies and started with simple-toned ones having two or three notes with easy turning points. It required me to memorize tones of few catchy folksongs to begin with, but not the wordings as such. This helped pique my curiosity enough to get enthusiastically involved. As I became fluent with improved music knowledge and skills, I fell under the spell of Ghulam Nabi (Phuk Brar) and Amir Gul Amir. They were accomplished artists, acknowledged for their masterly skills. The former was an extraordinary singer to the chorus of his own sitar whereas the latter was a gifted song writer, composer, singer and sitar player, who held sway amongst music admirers. Thus, most of my learning has come from modeling after these maestros. Being sitarist and vocalist are two entirely different capabilities; the combination of both in a single artist is a rare phenomenon from the standpoint of Khowar music at least. In my case, I am a solo sitar player, but not a singer or vocalist. To put it frankly, I am hardly conversant with the wordings of folksongs; nonetheless, I can clearly conceptualize a great many melodies. Sitar playing is an art akin to painting with formulae definable into the realm of musicology. But from the perspective of Chitrali sitar, it has not been possible since most past sitar players were not literate. They merely preserved the fundamental principles of the art in their felt knowledge, and applied it to produce music but could not interpret its technical parameters in writing. A new leaner must memorize tone(s) of folksongs to begin with sitar playing. He also requires a tutor to learn the basics. After teaching a number of aspirants over the years, I have come to realize it would not take far too long for an eager learner to unfold intricacies of melody composition. Once, a passionate student came over to me seeking for guidance. He did not know anything at all about sitar and its paraphernalia. Nor did he memorize notes. It was a perplexing situation. What I did was to task him with exploring the notes (pitches) within the 13 frets (purda) of sitar. Afterward, I facilitated him to practice a short-toned song with clear turning points, which he produced simply with one running (index) finger of the left hand. To make it easier, he penciled the frets where he was able to produce the required note(s) of the intended song. Within few days he became fluent in his playing. Chitrali sitar has diverse capacity to accommodate melodies, even that of other languages. But all this depends on the skills and expertise of a sitar player. It is interesting to note that even though you model your playing style after an expert trying to exactly imitate him, you will ultimately end up with your own peculiar melody in the background, the hallmark differentiating you from others. Old folksongs are unique combination of high-low pitched melodies with difficult turning points that normally cover all 13 frets of a sitar. Bearing this mind, experts recommend old folksongs to master the art of sitar playing. One of such songs could be ‘hardi majbor ki no boi ta faqiro na ka asheq reni na ka gaderi’. This song has ideal combination of low and high-pitch notes hence could be helpful to decode the treasure of melodies hidden within sitar frets. 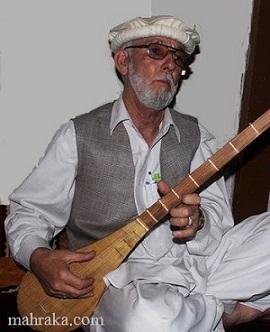 Ali Zuhur was a unique, creative and innovative sitar artist, who preferred to play it in high-pitch and was/is difficult for others to imitate. He was very fast with loud, clear and clean sound of strings. Evidently, his music truly represented his tumultuous feelings and pathos with their roots deep into the prospect of pleasures and pain, love and hate of the wider society where he lived. Simply through the medium of his star music, he fairly emotionalized and symbolized his feeling to an unforgettable pitch. There is a wide difference between the way sitar is being played in Upper and Lower Chitral. The music of Chitral Town is more refined perhaps the orchestras over here have had better patronization and encouragement. Alfatah Group has significantly contributed to revive the region’s dying folk music through the support and supervision of Chitral Club’s senior artists including Amir Gul and Phok Brar way back in 1980s. On the other hand, the music of Upper Chitral has grown independently without immediate supervision from any quarter. The music there is undoubtedly a creative and unique one touched by tones of Central Asian music. Nonetheless, this difference is rapidly bridged now thanks to improvement in infrastructure and communication particularly digital recording and its accessibility through mobile and other portable technology. Sitar music is more likely to trigger poignant feeling. Unlike the music of reed instrument (flute and surnai), this stuff is not something lively and vibrant. With the onset of sitar music, a series of past events recast in mind and melancholy overcomes you. It also demands considerable attention on the part of listeners. A minor side whisper might potentially dampen a decent music event. In recent years, the trend of Chitrali music has undergone drastic changes; new instruments have been introduced with far greater variation in melodies and the wordings of new songs have been adopted. But it has declined in decency, quality and vigor. Presently, there is no known band of reed and instrumenst and this art is on the verge of disappearance. The only surviving surnai artist is Ustad Taleem Khan, who is leading abysmally poor life. Somehow, the glimpse of this vibrant outdoor cultural music is still alive in Lotkoh valley of Chitral. But the trend of indoor music is constantly declining there as well. The reason perhaps is that a social stigma is attached with music overall and it is considered as something undesirable. Unless it is accepted wholeheartedly, it will be difficult to see any substantial progress in the field. Further, ill-conceived attempts at modernization of the indigenous Khowar music have rather done disservice and it is rather misrepresented. Addition of economic incentives to music looks like the only hope to trigger constructive competition amongst artists, which might result in their professional soundness that, in turn, will improve the quality of cultural music besides making it sustainable in the long run. We do not have proper forums to showcase our art across the country. We are not given air-time on TV channels, and media support is next to nothing. Sometimes, when rare opportunities of cultural publicity cross our way, then the artists spoil it. We have forgotten vital folksongs means our valuable cultural assets and a source of entertainment are about to die out. Unluckily, most of the senior folk dancers are no longer surviving and the new generation does not evince interest to learn. On my part, I have tried to pass down my music knowledge to next generation. I have taught a great many learners, the prominent ones being Aftab Alam, Assadur Rehman and Amiruddin.Aftab Alam has very successfully adopted my style. Lastly, I would say the indigenous cultural music of district Chitral is at a crossroads and none is forthcoming for the revival, protection, promotion and marketing of this precious musical heritage that could create income earning opportunities for artists, who are the most vulnerable segment of the society.